I found a rather interesting device, the CAI WebControl board. I purchased it on Amazon.com (WebControl ($35 plus S&H)). It's an embedded web server with 8 inputs, 8 outputs, 3 analog inputs, 8 DS18B20 temperature probes and 1 one-wire humidity probe (a $15 Honeywell probe). Yup, looks like it supports all of that at one time! I'm definitely going to purchase a few more of these. WebControlUserGuide2-03-03.pdf <- Latest and greatest, matches my V3.03 firmware. The random number is to get around caching issues in browsers. Each time you call the URL you need to have a different random numeric value. I've already poked around the board to see what it has and the PCB is rather interesting. It has 7 main connectors. There is one connector for DC power (6v - 9v DC). I'd recommend a heat sink for the pwoer transistor next to the power connector. With my 7.5v/1A power supply the transistor was slightly uncomfortable to the touch. 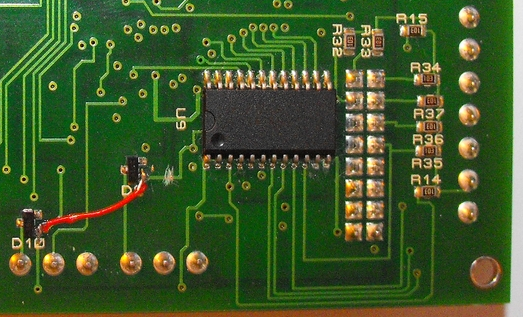 The RS232 and RS485/RS422 don't have the driver chips installed. There is one set of connectors (only counts as 1) for the output, there is one IDC connector and I'll guess that's for input (digital and analog input). There's 1 (3 wire) connector for the temperature probes (can't be passive) and 1 (3 wire) for the humidity probe (more details later). The are 3 additional jumpers. One is probably the in-circuit programming header and I'm uncertain what the other two are for yet (perhaps RTFM ;-) ). There is also a 4 postion dip switch which is probably for the RS485/RS422 section (biasing resistors perhaps). I think the CPU used is a PIC 16F88A and that the RJ45 jack contains the ethernet cpu, IO chip and magnetics. I'm guessing that it's one of those serial to Ethernet jacks. Either that or its a Microchip ENJ i2c setup. I'll investigate that more later. Like I said this little board has tremendous value for the money. I certainly could match this price if I built my own board. A fix for inaccurate temperature probes. More details later. The WebControlTM PLC firmware can be programmed to execute programmable logic sequences, including comparison and sub routines. This is the major change from the BRE(Boolean Run Engine) version firmware. WebControlTM PLC uses assembly like PLC language. It starts with "START" and finishes with "END". The PLC program is pasted into the web GUI. WebControl will automatically store it into its EEPROM so that if recycle power will not lose the program. The limitation of the PLC is 4000 line of code. The support for PLC programming is not included in the free support for configuration of WebControlTM PLC. A PLC program is made up of main routine and optional subroutines. The main routine is enclosed between mandatory START and END instructions e.g. If sub routines are used then they are listed after the main routine body. Sub routines start at their label and must end with the instruction RET e.g. Subroutines can be called from the main program and from within other subroutines. Note that WebControl PLC has a program return address stack depth of 8. The program control block has a zero bit that is updated implicitly on most instructions. This zero bit can also be used implicitly when using branch and call instructions. E.g. the following test instruction yields a Boolean result which will implicitly set the state of the zero bit. Next a branch instruction is used which branches on the state of the zero bit. Labels must be terminated with a colon ':' and can be a maximum of 10 characters. evaluates to false then the next instruction is skipped. test evaluates to false then the next instruction is skipped. SET                  a b             Sets I/O id a to the value of b.
DEC                  a                   Decrements a by 1. Zero bit updated. INC                  a                   Increments a by 1. Zero bit updated. into d. Zero bit updated. BZ                   (a) b               Same as BNZ but tests for zero value. instead of branching. See section on program address stack. CZ                   (a) b               Same as above but tests for zero result. GOTO                 a                   Branches to program address specified by label a. DELAY                a                   Delay instruction, delay specified in 1/1000 seconds. NOP                                      A no operation instruction. RET                                      A return from subroutine instruction. EMAIL                a                   Sends email, a = index of message to send. a signed 32 bit decimal number. e.g. 100 or 1 or 0 etc. a hexadecimal number. e.g. 0xABF. an I/O identifier that is a place holder for the real I/O value that the PLC engine will get at runtime. Valid I/O identifiers are explained next below. 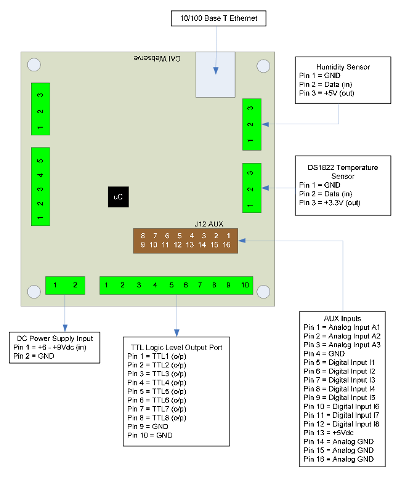 T1             Temperature sensor inputs 1...8 Valid range -550 - +1250. T2             Note that temperature values are specifies in 10's of degrees. So to test for 21.6 degrees C you would use the value 216.
operator not valid on these. Flashes output 2 at a rate of 1Hz. (Please note OP2 has no space in between). To setup a momentary output on OP3 of 1 second the following rule should be used: Note you may change the momentary length to 0.5s by change the value from  to . OP3 has no space in between. This simple program performs 4 separate I/O checks and sets O1 to O4 states depending on the state of some inputs. The following simple program shows how to set-up sequential I/O. This example will have four subroutines. WebControl PLC will continuously loop through them. The "hourly" routing will compare analog input 1 and analog input 2, if A1 > A2, send an email notice 1. You can use similar logic to adjust your solar panel orientation each hour, etc. The "period" subroutine will turn on night light after 18 hours and turn it off at 5AM. The "monthly" routing will check the "salt low" sensor AIP3 on the water softener and send email notice 2. The "yearly" routing will ring the New Year's bell connected to OP8 on each and every New Year's Day for the whole day! ;* subroutine will turn on night light after 18hours and turn it off at 5AM. ;* softener and send email notice 2. This is a PLC program to charge 3 serially connected NiMH batteries. First, it tries to discharge the batteries individually. If any battery discharged to 1V, it will stop the discharge and start charging. When each cell being charged to 1.25V, it will stop charging. We assume the A1, A2, and A3 being calibrated to 1V=100. The measurement on the battery 2 is the total voltage of battery 1 and battery 2. And the measurement on battery 3 is the total voltage of all three batteries. This example will individually discharge and charge each battery. For office door using RFID reader, as well as allowing operator remote browser control, the following program provided the example. RFID reader's NC (normally connect) output connects to IP1 on WebControl digital input. A 2.2K pull-up resistor also connected between IP1 and 5V. In this way, each time a valid RFID tag sensed, a TTL "1" feeds to WebControl IP1. Remote operator can also open the door by using browser set OUTPUT TTL1 to on. OP1 connects to the door open switch. TESTEQ logic will make sure the OP1 is an 1 second momentary output. "LIGHTS" subroutine is for light control outside the office door; the light is on at 7PM and off at 5AM. Appliance Module - Washing machine interface. I could use this for my washer and dryer.